EPHJ – EMPT – SMT – l´evento leader per l´industria dell´alta precisione – è la più grande manifestazione fieristica della Svizzera. Nel 2017 ha riunito più di 800 espositori e oltre 20.000 professionisti provenienti da tutto il mondo, in continuità con la costante crescita di cui ha goduto sin dalla sua prima organizzazione nel 2002. Il nostro 17° show avrà luogo presso il Palexpo di Ginevra dal 12 al 15 giugno 2018. •	Welcome kit: catalogo della fiera, guida della città, mappe…. The #next.photonics_forum entitled "Winning the future - Europe's age of light" will be held on 8th and 9th March 2018 in the Museum of Fine Arts/Musées Royaux des Beaux Arts and the Bluepoint Conference Centre in Brussels.The annual event continues the further strategy development of the Photonics Public Private Partnership in preparation of the new EU framework programme. On the second event day the European photonics community will launch the strategy process for a new photonics multiannual roadmap for the next 10 years. As inspiration for this strategy process the symposium on the first day will cover some high level ignite talks providing a global view on Digitisation and Internet of Things as well as latest developments in Industry 4.0 and Virtual and Augmented Reality. The Photonics21 Vision Paper "Europe's Age of Light! How photonics will power growth and innovation" presents the vision of the European photonics community for 2030. The report was prepared as outcome of 8 thematic strategy workshops with the European photonics community and outlines the great challenges facing Europe and the world. 8 missions present a vision of how photonics technologies which are already in the innovation pipeline today can solve these challenges by 2030 and beyond to turn this vision into reality. The Photonics21 vision document serves as input to the preparation of the ninth EU framework programme and was presented to MEPs and representatives of the European Commission on 28th November 2017 alongside a Photonics21 breakfast session in the European Parliament. 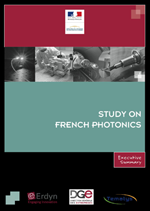 If you would like to receive one or more hard copies of the document please write us an e-mail to secretariat@photonics21.org by indicating your postal address and the amount of copies you would like to receive. 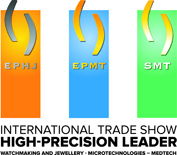 Il salone EPHJ-EPMT-SMT, la più grande fiera commerciale svizzera del settore delle lavorazioni di alta precisione dei produttori di orologi e gioielleria (EPHJ), microelettronica (EPMT) e tecnologie per la medicina (SMT) avrà luogo a Ginevra dal 20 al 23 Giugno 2017. Il programma di quest’anno pone un’enfasi speciale sull’innovazione con uno spazio dedicato alle start-up e l’introduzione di un premio, Exhibitors Grand Prix 2017, per il progetto più innovativo. Vice President Photonics21 and leader of the Photonics PPP Task Force “Financing” Giorgio Anania, gave at the recent EPVF Event in Eindhoven a Key Note Speech on the current status of the “Financing Photonics” situation in Europe. The speech does not only show the gaps in Financing - particularly for young and small/midsized companies - but also shows the clear commitment of the Photonics PPP to deeper evaluate and support actions to open up new sources of urgently needed financing of SME’s and start-up’s. Technology which is 100% made in Italy at the service of the international scientific community, which since 1986 monitors the health of Antarctica. It is the Quanta System laser, the first in the world to be installed in the Earth’s coldest continent in order to measure the ozone layer, exposed from 6 October to 2 November 2015 in Rome at the Vittoriano in an exhibition that celebrates the 30th anniversary of the Italian South Pole expeditions. The inauguration took place at the presence of the Minister and the executive staff of the Ministry of Education. La piattaforma tecnologica Europea PHOTONICS21 ha pubblicato una brochure informativa sulla Private Public Partnership (PPP) Europea per la Fotonica e sulla stato dell’industria Europea. The Italian National Technology Platform (NTP) of Photonics, CORIFI (COordinamento Ricerca e Innovazione Fotonica Italia) has been founded on April 2014 as a legal entity linked to AEIT, to represent the whole Italian photonics community. The platform has now 82 members from academy, research organizations and industries. In particular about 20% of the platform’s members are representatives of the main Italian photonics large industries and SMEs. CORIFI is composed of the executive board and 7 working groups, mirror of Photonics21 working groups, which focus on application-oriented as well as cross-disciplinary photonics fields. The AEIT-CORIFI executive board is constituted by the President, two academic Vice-Presidents and two industrial Vice Presidents and the chairs of the working groups elected by the platform members. The main national associations operating in photonics (i.e. SIOF, IEEE Photonics Society) as well as the main photonics regional clusters (i.e. OPTOTOSCANA) are represented in the board of the stakeholders. The main objective of AEIT-CORIFI is to overcome the fragmentation of national research and innovation (R&I) activities and to promote the Italian research and innovation (R&I) excellence in photonics with the national, regional and EU institutions. On May 2015 AEIT-CORIFI has presented its first research and innovation strategic agenda to representatives of the Ministry of Economic Development (MISE), of the Ministry for Education, Research and Innovation (MIUR) and of CONFINDUSTRIA. The agenda wants to serve as reference point for national and regional authorities involved in the definition of research and innovation priorities and their smart specialization strategy. OPTOSCANA is the innovation pole of Tuscany for photonics and space. The Society of Optics and Photonics (SIOF) is the Italian branch of the European Optical Society. SIOF was established in 1991 to promote research and development in the field of optics and photonics and to coordinate such activities throughout the country. One of its tasks is therefore the dissemination of knowledge related to these disciplines. The IEEE Photonics Society Italy Chapter is the Italian branch of the IEEE Photonics Society. The chapter was founded in 1997, with the former name of LEOS Italian Chapter, to promote research and development in photonics. The chapter activity includes: national and international lecturers; workshops and conferences; awards and prizes. In particular, each year, the chapter recognizes distinguished work by young Ph.D. doctors in the field of photonics (laser, electro-optical devices, optical fibers, electro-optical techniques, quantum electronics and all those applications where lightwave technologies are the key) through an award for the “Best Doctoral Thesis” discussed in an Italian university. E’ stato pubblicato sul sito del Governo Francese un recente studio sullo stato della ricerca e delle risorse economiche ed industriali della fotonica in Francia. Lo studio verrà ufficialmente presentato il prossimo 17 giugno a Parigi. Questo studio vuole essere uno strumento per mettere insieme i principali stakeholder della fotonica in Francia per costruire progetti congiunti basati su nuove applicazioni e innovazioni tecnologiche, facilitare la creazione di nuove imprese, e la crescita fino al 2020, in accordo alle priorità nazionali ed internazionali. 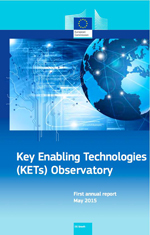 E’ stato pubblicato dall’osservatorio sulle tecnologie chiave abilitanti (Key Enabling Technology – KET), istituto dalla Direzione Generale per la Crescita (DG GROWTH) della Commissione Europea, il Rapporto Annuale sulle prestazioni delle 6 KETs della Commissione Europea: Fotonica, Micro e Nano-Elettronica, Nanotecnologie, Biotecnologie, Materiali Avanzati e Manufatturiero Avanzato. Il report analizza e discute dati sulle potenzialità in termini di tecnologia, commercio, produzione e fatturato delle KET negli Stati Membri dell’Unione Europea. More than 100 young investigators of all nationalities working in Italy and young Italians working abroad have gathered in Milan in 2013 and in Rome in 2014 to discuss the present and the future of the multi-disciplinary research field of Plasmonics. It turned out that more direct communication provides more ideas, a fair competition and the build-up of excellent personal relations. The economy crisis brought to a significant decrease of Italian public spending for research. Instead of just complaining and/or quitting their research jobs, young researchers with activities in the fields of Plasmonics and Nano-optics have decided to meet up and talk to each other in a series of dedicated workshops. Plasmonics is the interdisciplinary field of research located between physics, chemistry, biology and engineering that exploits the natural oscillations of the electron plasma, present in all metals and semiconductors, to obtain performance improvements of photonic devices at infrared and visible light frequencies. It can also be considered a sub-field of metal/semiconductor nanotechnology were light plays the role of the external driving force. The workshop topics based on technology advances were: Plasmon-enhanced Nanospectroscopy and Nanoimaging, Optical Antennae and Metamaterials, Integrated and Hybrid Devices (sensors, waveguides, and photovoltaics), Plasmonics for Biology and Medicine. Three topics with more futuristic flavor were also discussed: Unconventional Plasmonic Materials and Frequency Ranges, Quantum Plasmonics and Magneto-Plasmonics. Currently Europe is able to keep its world market share in photonics at 18 percent, whereas other regions traditionally strong in photonics, like the US and Japan, have already lost shares to China, South Korea, or Taiwan. However, the global shift of the photonics market share to Asia is becoming an increasing threat to the European photonics industry . To stay competitive, the European photonics community needs to further join forces to develop and implement a common strategy for Europe. Europe must strengthen its industrial leadership by promoting wide-scale cooperation and better integration across the whole research and innovation value chain. The full photonics value chain does not yet exist in many EU Member States, and this presents a significant barrier to expansion of the photonics industry. The Photonics Public Private Partnership (PPP) established in Horizon 2020 is the mechanism for achieving these goals. The time is now right to take the next step and combine resources at all levels – European, national, and regional – adopting one cohesive strategy to significantly strengthen the sector and move toward new advanced photonic technologies. The European photonics community can then address the grand challenges facing European society and maximize the economic benefits derived from the next generation of photonics products. •to mobilize, pool, and leverage public and private resources to provide successful solutions for some of the major societal challenges facing Europe, particularly in healthcare & well-being, and in energy efficiency. Nobel Prize in Physics 2014 awarded for the invention of efficient blue light-emitting diodes enabling bright and energy-saving white light sources. The Royal Swedish Academy of Sciences decided to award the Nobel Prize in Physics for 2014 to Isamu Akasaki (Meijo University, Nagoya, and Nagoya University, Japan), Hiroshi Amano (Nagoya University, Japan) and Shuji Nakamura (University of California, Santa Barbara, CA, USA) “for the invention of efficient blue light-emitting diodes which has enabled bright and energy-saving white light sources”. In the spirit of Alfred Nobel the Prize rewards an invention of greatest benefit to mankind: using blue LEDs, white light can be created in a new way. Nobel Prize in Chemistry 2014 for the development of super-resolved fluorescence microscopy. The Royal Swedish Academy of Sciences awarded the Nobel Prize in Chemistry for 2014 to Stefan W. Hell (Max Planck Institute for Biophysical Chemistry, Göttingen, and German Cancer Research Center, Heidelberg, Germany), Eric Betzig (Janelia Research Campus, Howard Hughes Medical Institute, Ashburn, VA, USA) and William E. Moerner (Stanford University, Stanford, CA, USA) for the development of super-resolved fluorescence microscopy. In 1873, the microscopist Ernst Abbe stipulated a physical limit for the maximum resolution of traditional optical microscopy: it could never become better than 0.2 micrometres. The three Nobel Laureates in Chemistry 2014 are awarded the Nobel Prize for having bypassed this limit. Due to their achievements the optical microscope can now peer into the nanoworld. La Guida per l'amministratore del sito è in avanzata fase di redazione. La guida non è stata preparata con lo scopo di facilitare la amministrazione del sito, dato che essa è estremamente intuitiva, ma con quello di evidenziare le funzionalità del sito. Il documento è corredato di molte immagini che possono ulteriormente chiarire i vari passi delle diverse procedure.